I arrived in Shanghai right as the Lunar New Year celebration began. A whole week of fireworks going off: day AND night; goats on display (of the cartoon/plush/display variety); and red everything (my favorite displayshave been of the undergarments). 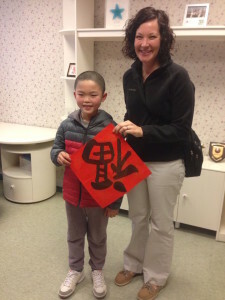 Here I am with a traditional Chinese calligraphy sign for the front door. It is done on the diagonal, and hung upside down for prosperity and good luck. This little guy did a great job. It has been nice to have time off exploring the city, adjusting to the new sleep schedule, and familiarizing myself with my new home for 3 months before school starts up again. I met with Lily Hsu, the program director, as well as the other girls who work in the office. The city is pretty easy to get around on the metro, and at 50 cents/ride, very affordable too! Project Hope was founded in 1958 and has 35 country offices. The Shanghai office has focused on some of the country’s most pressing health issues including children’s heart defects, diabetes, HIV/AIDS and nurse education. While in Shanghai, I will be educating nursing students at San Da University School of Nursing. 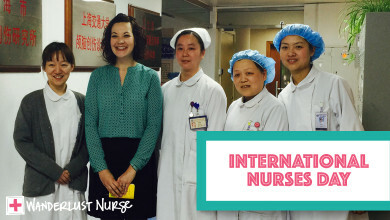 The school was founded in 2011, and aims to become the best nursing school in China while meeting the international nursing education standards. I am preparing to start teaching by gathering journal articles, reading reference material, and beginning to outline my lectures. I will be lecturing for Intensive Care Nursing: introduction, psychosocial aspects, management of pain and sedation, and nutrition assessment and support for ICU patients. 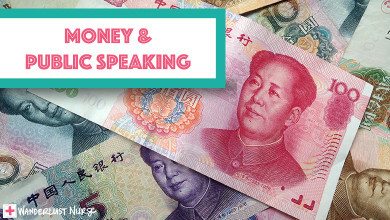 I will also assist with the Professional Nursing English class by leading several conversation classes with case studies, as well as teach the respiratory and circulatory systems in English. Additionally, I will teach classes on the healthcare system in America, as well as about travel nursing. Admittedly, I’m quite nervous to teach here. Chinese fluency or knowledge was not a requirement of the position, yet I’m worried about how the students will understand me. The Intensive Care Nursing classes are 160 minutes of teaching time, with a 10 minute break in the middle. It’s a very long class to teach and I have not taught that long before! I am grateful for the experience and know I will be a resource here, but a girl can be worried, can’t she? As I start to teach classes, help more in the Project Hope office, and observe the healthcare system here in Shanghai, I will write more. Until then, “zai jian” (goodbye). You will do great Jen. As with everything in your life, you will rock! Thanks Steph! It’s definitely been an experience!